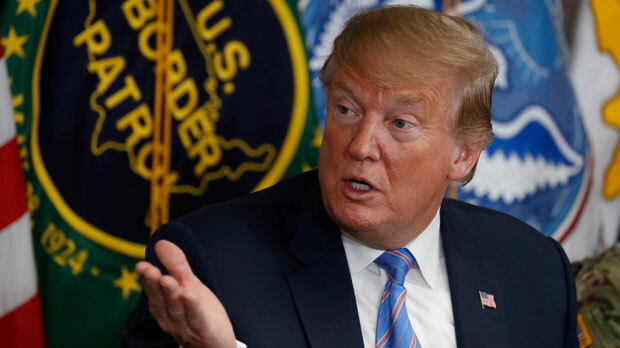 WASHINGTON (AP) — President Donald Trump said Friday he is considering sending “Illegal Immigrants” to Democratic strongholds to punish congressional foes for inaction on border security— just hours after White House and Homeland Security officials insisted the idea had been rejected as fast as it had been brought up. The tweets, which appeared to catch officials at the Department of Homeland Security by surprise, came as critics were blasting news that the White House had at least twice considered a plan to release detained immigrants into so-called sanctuary cities. Critics branded the plan, supposedly rejected, as an effort to use migrants as pawns to go after political opponents. The idea of pressing immigration authorities to embrace the plan was discussed in November and then again in February as the Trump administration struggled with a surge of migrants at the border, according to three people who spoke on condition of anonymity to outline private conversations. Homeland Security and ICE lawyers quickly rejected the proposal, according to the people, and it was dropped on the grounds that it was too expensive and a misuse of funds, one official said. “This was just a suggestion that was floated and rejected, which ended any further discussion,” the White House official said. Officials say they are running out of options, and have proposed and recycled numerous ideas that have never come to fruition. Trump in recent weeks has discussed the idea of renewing his administration’s controversial family separation policy. And he and aides are weighing forcing asylum-seeking families to choose between being detained together as their cases make their way through the courts or sending their children to government-run shelters. Associated Press writers Nomaan Merchant, Lisa Mascaro and Deb Riechmann contributed to this report.